Written by Alex Towns. Uploaded 5 March 2007. And so we emerged from the red rust dirt road and glided onto tarmac once more, somewhat relieved that Tinfish had not joined the many abandoned vehicles that we'd past on the 1055km of nothingness that is the Great Central Road. Ahead of us we looked forward to exploring the amazing attractions of the red centre... Kata Tjuta (aka The Olgas), Uluru (aka Ayers Rock) and Watarrka (Kings Canyon) National Park. Seeing as it was the middle of summer in the desert, it perhaps wasn't the best time to visit, although we hoped that would keep the crowds away too. Unusually, however they'd recently experienced a lot of rain, so the once dry desert was alive with flora fighting to make use of this ever so precious commodity. After a much needed lunch break, we filled up our water packs and headed over to Kata Tjuta. Although slightly less well know as Uluru, Kata Tjuta meaning 'many heads', is no less impressive. A bizarre collection of 36 huge rounded rocks, the monoliths form an impressive scene and is of great Tjukurpa significance - a centre of Aboriginal law, religion and custom, so secret that only the initiated are allowed to know the full meaning. So for us tourists it was just another magnificent display of the weird and wonderful mother nature at work. To ease ourselves back into some exercise we started off with the shorter 2.6km Walpa (Windy) Gorge Walk which is a desert refuge for plants and animals. The rocky track gently rises along a moisture rich gully, passing inconspicuous rare plants and ending at a grove of flourishing spearwood. As you stroll between the immense domes you can't help but be captivated by the sheerness of the rock walls and the beautiful colours that abound as the sunlight strikes the path. Although from a distance the domes look like smooth rocks, on closer inspection they are in fact built up by a conglomerate of smaller round pebbles and boulders which have been cemented together by a sediment of mud and sand and then subsequently sculptured by thousands of years of wind and rain. Having built up a slight sweat during our midday walk.... The normal time we seem to do anything outdoors, we decided to venture around to the main walk of Kata Tjuta. Unfortunately the more demanding 7.4km walk of the Valley of the Winds we were soon to find out gets shut during extreme weather conditions, i.e. when they are expecting temperatures in excess of 36C and today was no exception. Regardless we decided to set off but after about 1km we arrived at the first lookout and from here on the track was indeed closed. We were somewhat disappointed as the walk around Kata Tjuta is simply stunning. In many other countries en-route we might have simply slipped past the sign and carried on, but in Australia with a colossal $2500 fine if caught, we decided not to take the risk and returned to the car park. Hmmm, what to do now? It was too late to do any serious walking around Uluru, but too early for sunset, so we decided to just drive round to Uluru and catch a glimpse of this Aussie icon, before heading out to find camp. Having taken a few photos of the rock we set off towards the resort to find out what was available, especially on the fuel situation as we were now quite empty after our epic journey across the desert... the beauty of long range fuel tanks meant we could avoid filling up at a staggering $1.90 per litre in the precious few outback roadhouses! On leaving the park we passed the entrance booth and realised our entrance via the Great Central Road had unexpectedly gotten us in through a 'back door'! Needless I wouldn't advise anyone try and take this arduous route, needing two sets of permits to travel through Aboriginal land, simply to avoid the $25 park entry fee - which is surprisingly good value since it is valid for 3 days. The resort, Yulara, is the centre of all activity and is basically a mini town catering to all the tourist needs... civilisation in the middle of nowhere with beer and karaoke for the hordes of Japanese! We quickly decided to avoid the resort campsite if at all possible and continued back out into the desert. Before too long we passed a little sand track which doubled back over the dunes. Surprisingly there was no warning sign saying no entrance, although we did pass something lying face down in the sand! Following the twisty turning track, up and down the dunes and past the spiky spinifex bushes we were soon far enough away from the main road for an ideal outback camp. On clearing one dune we were welcomed by the sight of Uluru standing majestically in front of us whilst over to the right Kata Tjuta stood out against the horizon... damn near perfect I'd say... if it weren't for the downward slope of the dune! A few minutes later with the shovel and we backed the rear wheels into a hole which flattened Tinfish off a treat... absolute perfection! With such an ideal camp, we simply unwound reading our books with the picture postcard scene stretched out before us. Hopefully no one else would be coming down the track whilst we were in residence. Rustling up some bush tucker we watched the sky slowly darken, with the orange glow highlighting Kata Tjuta and bouncing off a glowing Uluru whilst the stars started to pop out one by one at first and then later in galaxies, all complemented by the comet streaking to earth between the two monoliths. Wow - breathtaking! Watching this performance unfold got me thinking once more about the indigenous people that originally inhabited this great land. "Tjukurpa is our religious heritage, explaining our exisitence and guiding our daily life. Like religions anywhere in the world, the Tjukurpa provides answers to important questions, the rules for behaviour and for living together. It is the law for caring for one another and for the land that supports our existence. Tjukurpa tells of the relationship between people, plants, animals and the physical features of the land." The teachings of Tjukurpa are not written down, but have been handed down from generation to generation in stories, special places, songs, dances and ceremonies. "We learnt from our grandmothers and grandfathers and their generation. We learnt well and we have not forgotten. We've learnt from the old people of this place and we'll always keep the Tjukurpa in our hearts and minds. We know this place - we are ninti, knowledgeable. With knowledge comes responsibility." Without any outside influence for tens of thousands of years, you can easily see how these creation stories came about. Only knowing what was in front of them the Aboriginals not only tried to give concept to the world around them, but also used this as a basis to form their laws and a strong relationship grew between themselves and the land. Having always been hunter gathers, moving from food source to food source with the seasons it reminds me of a land that time forgot. What a shock it must have been when the white fella arrived piranpa (literally white) for the first time in numbers as recently as 1788. When as long ago as between 60,000 and 30,000 BC Aboriginals originally settled in Australia, most likely from Timor, in all that time their life style and culture remained totally unchanged, not much removed from our vision of the cave man. To suddenly then be catapulted into a 'modern' day society is a stress and challenge that the indigenous peoples still struggle with to present day. I reflected on all the countries we'd travelled through on this epic journey to get here and I couldn't help thinking that every single country had some kind of associated ancient civilisation of some degree of grandeur and it was these edifices and temples that helped define that nation and what tourist now flock to see. Here however it is a totally different story. It is simply the land in Australia that sets the scene and the indigenous people have lived in harmony with it all this time, never needing to conquer, build empires or raise stupendous structures and offerings to the gods. When they are the children of the land, they learn to respect it and even if a story of two ancestral snakes throwing spears at one another to form the landscape (regardless of the fact snakes don't have arms!) seems a little far fetched to us... how would our story of one man and 7 days seem to them! Perhaps in the worrying times of global warming we could learn a little from these people who see themselves simply as caretakers to the land! With dawn approaching I slid the camera lens out of the tent flap and watched Uluru awakening. We had learned that The Valley of the Winds walk was open until 11am so that was our first objective for the morning; although at over an hour away from where we were camped we'd need to get a move on. Stopping to buy a ticket at the park entrance, we briefly paused at the Kata Tjuta viewing area to take in the view from another angle and then finally arrived at the car park just gone 10am. We hot footed it towards the first lookout Karu and passed the point of no return at least 30mins before the 11am closure. The effort of this walk, made arduous in the heat of the day, is definitely worthwhile as you follow a looping track to the second lookout Karingana admiring the surreal views of the domes and listening to the wind and bird calls echoing amongst the gorges, definitely a highlight of any trip to the centre. Next up, a lunch stop in the shadows of Uluru... where else of course! Australia's favourite postcard image is 3.6km long and rises a towering 348m from the surrounding flat sandy scrubland. It is believed that two-thirds of the 'rock' lies beneath the sand and many see climbing the rock almost as a rite of passage. Although you are still permitted to climb, for the local Anangu, the path up the side of the rock is part of the route taken by ancestral Mala (hare-wallaby people) men on their arrival at Uluru and as such has great spiritual significance. 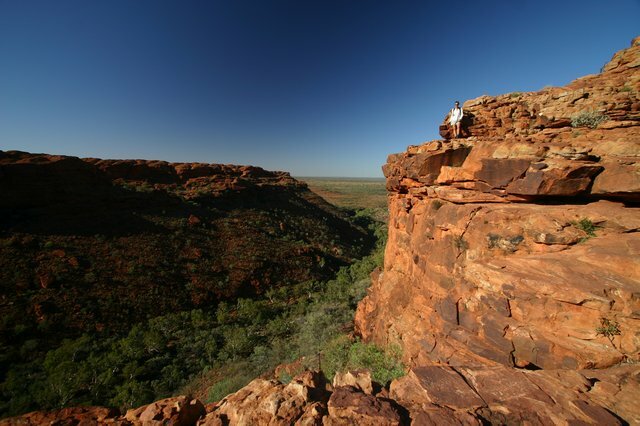 As a guest on Anangu land, they request that visitors respect their law and culture by not climbing. "Listen! If you get hurt, or die, your mother, father and family will really cry and we will be really sad too. So think about that and stay on the ground." "Anangu say that at the beginning of time the world was flat and featureless. Out of this featureless surface, very powerful ancestral beings travelled across it, having adventures and leaving their mark on the landscape. Some ancestors travelled thousands of miles across the country and their trails link sites across the country of many different Aboriginal peoples. Others stayed in one place and brought their special effect to that area alone." After learning a little of the Tjukurpa legends surrounding the region, we thought it was a shame that they didn't have any geographical information on how these two rock formations occurred. Having already decided that we weren't doing the climb, we set out on the 9.4km base walk hoping to complete it in plenty of time to be back ready to admire the sunset. This walk reveals the natural beauty and rich culture of Uluru as you follow in the footsteps of the ancestral beings that shaped the landscape. Although not particularly arduous, even in the late afternoon sun and with precious little shade it soon becomes quite an effort to keep on going. The rock is definitely spectacular and every corner you can look in awe at the shapes and colours, however as the heat gets to you, you seem to just concentrate on putting one foot in front of the other! About halfway round we took a welcome break and filled up from the drinking water tank, whilst we nibbled on our energy food of raisins and nuts wondering if we might flag down a car for a hitch back to the car park! At least now we'd have the sun in our faces to give our backs a little of a reprieve, although that novelty soon wore thin! At one stage our spirits lifted when we saw buses in a car park, hoping we'd see Tinfish, but soon realising it was a different car park ferrying the lazy tourist to key points of interest! This particular spot was the Mutitjulu waterhole. Home of Wanampi, an ancestral watersnake and thankfully in the shade. Maz rested her weary legs, whilst I battled with the camera which has taken a turn for the worst of late... possibly exhausted from over work! With the sun sinking quickly now, we put on a final spurt and eventually collapsed into Tinfish..! After predominantly driving for the last month we'd shocked our bodies into nearly 25km of walking over the two days, all in the desert heat! We felt quite pleased with ourselves as we set up table, chairs and a cool glass of Mad Fish Rose to watch the spectacular display of sunset at Uluru. Unlike Kata Tjuta, Uluru is made from a solid sedimentary rock called arkose sandstone, a coarse grained sandstone which mostly contains a mineral called feldspar. Weathering of Uluru gives the rock its red colour. The iron minerals in the rock are weathered by water and oxygen, in a similar way to iron rusting. The feldspar minerals within the arkose sandstone are also weathered and form clays, which contribute to the colouring. As the sun set, we sipped our wine as it illuminated the Rock in burnishing oranges, then a series of deeper and darker reds before finally fading into charcoal. The end to an excellent day. We returned to our bush camp for one more night, then in the morning stocked up with food, water, a quick cappuccino and fuel at Yulara before heading off towards Kings Canyon. Filling with fuel has become somewhat of an art since the cracked fuel tank we had fixed with chewing gum at great expense in Perth has sprouted a leak again. It's always the last thing we do before heading off, to avoid a puddle forming under Tinfish if parked up. Fortunately the leak is on top of the front tank and with careful angling of the fuel hose I can get most of the fuel into the rear tank, so it's only a bit that leaks out each time when the front tank is totally full. The long distances between fuel stops was now behind us, so as long as it didn't fail catastrophically we should survive from here on in! Watarrka (Kings Canyon) National Park is a further 300km away so we broke the journey for lunch at Mt Conor lookout, a large mesa (table-top mountain) that is commonly mistaken for Uluru by eager souls! 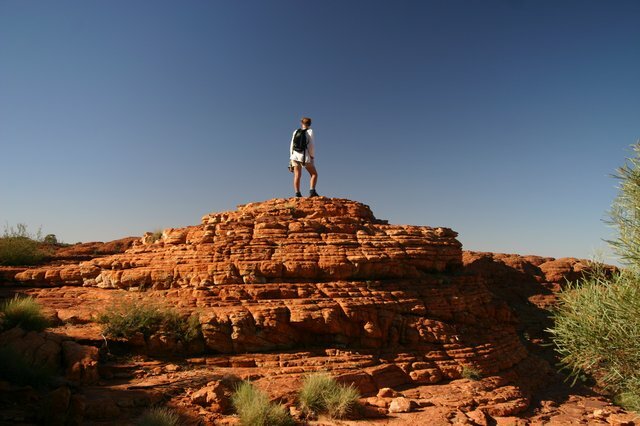 Although less frequented than its two nearest more famous neighbours, Kings Canyon is no less spectacular. We arrived late in the afternoon, with time only to stroll along the Kings Creek Walk, crooning our necks to look up at the 100m sheer walls of the canyon. At the end of this short walk you are greeted by amphitheatre like views of the towering canyon rim. Tomorrow morning we'd start early to avoid the heat and climb up to the rim and do the entire 6km loop walk around the rim of Kings Canyon, but for now we needed to find camp. After a few dead ends, we found an ideal spot, safely tucked away from the road, but with views back towards Kings Canyon so that we could savour the sunset display. Now I might have built up quite a idealised vision of life in the bush and moving from one picture perfect bush camp to another, however camping in the bush is not without it's challenges to endure! Mainly the 24hr aerial bombardment! Daylight shift are the bloody flies and these buggers are persistent. Even wearing a fly net they invade every orifice and somehow find a way in, driving you quite literally mad! Sitting reading a book and admiring the views, whilst sipping on chilled Chardonnay and munching on nibbly bits is quite tiresome when you first have to negotiate a fly net and simultaneously swat for flies, removing them alternatively from either your food or drink! At one stage, enraged I got out the can of fly spray and kept a chemical shield up in defence, but after you've inadvertently sprayed yourself in the face a number of times you have to admit defeat! Fortunately they can't get through the tent fly screen so it wasn't unusual to see us both diving upstairs for cover, but incredibly even in the time it takes to dive in through the tent flap at least half a dozen flies would follow you in..! With the sun setting a change in shift occurs and now out come the mosquitoes, so we lather ourselves up with deet mozzie spray and start burning mozzie coils. Although the continued high pitched buzzing in your ears tries your patience, fortunately Maz is far tastier than I and she receives the lion share of bites! With the sun now fully down, the mozzies disperse and the moths (along with any other flying insect) take to the sky's, homing in to every light, but especially attractive appear to be our head torches! You just have to grin and bear the continued moth in the face and beetles crawling through your hair! Moths also have a peculiar taste for red wine and flock around any glass left unguarded! Unfortunately the tiny flying bug (gers) can find a way into the tent, so just before lights out a quick puff of the insect killer results in a hundred or so of the critters raining down on to our bed - nice! As dawn breaks, we're normally woken by the early morning 'AHH, AHH, AHH' calls at full volume from the local magpie crow whose favourite roost is the tree under which we've conveniently parked and if you're lucky you sometimes get these accompanied by the 'SQUARK, SQUARK' of the local flock of cockatoos chasing each other! By the time you emerge from the tent, the flies are already out in force waiting to annoy to the extreme. And so the cycle continues! It's surprising how tolerant you become to another random bug crawling on your arms, legs or even face! Up early again for our climb around Kings Canyon, it starts with a strenuous initial climb up a steep slope before you find yourself at the top of the gorge. From here on you follow a 6km loop track around the rim with simply awesome views as you approach the sheer edge of the canyon. Again the rocks change colour with the passing of the sun and once again the strata is totally different with flat sedimentary layers a few inches thick stacked in sheets one upon the other, or lifted and pointing at peculiar angles with the force of rock movement. The top has given rise to some spectacular erosion. If you can imagine it was originally a perfectly flat rock surface (in fact the flat seabed of a shallow sea) which has checkerboard cracks running across it perpendicular to each other. Over the ages wind and water have exploited these cracks and eroded channels and in turn the remaining rock has been weathered to form a chessboard full of huge domed sandstone structures, not too dissimilar to a field of classic beehives! In some places it is still possible to see the ripple of the sand, frozen in time in rock, from when it used to be the actual seabed! As you get to the head of the canyon, you can follow a track down to the aptly named Garden of Eden with its tranquil pools and prehistoric cycads. Being nicely shaded it is a welcome retreat from the heat of the sun and with shoes and socks off, a quick paddle in the water revives tired feet. It's quite possible to get a little too comfortable, but there is still a fair few km's left to wander and the path from here lets you get right up to the edge in the most dramatic place. With no safety rail, it's a bit of a knee trembler, with the wind tugging menacingly at you and your mind reminding you that you are in fact standing at the top of an overhang which plummets 100m to the canyon floor below! Of the three attractions this one remains our favourite.